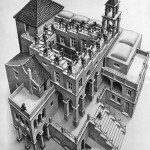 Have you ever seen any drawings by M. C. Escher? 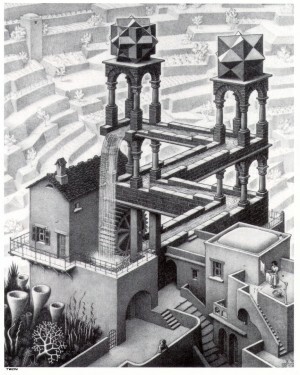 M. C. Escher is my favorite artist because his drawings challenge the mind just by looking at them. 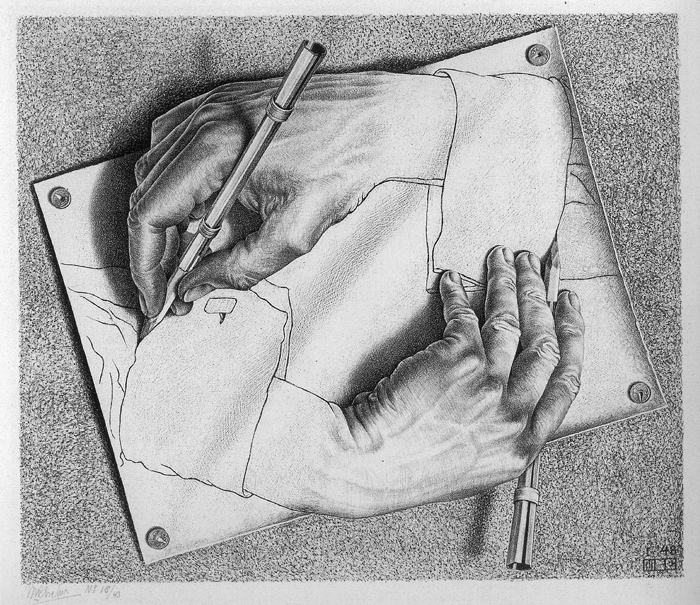 He has pictures of a hand drawing another hand, which is drawing the first hand. He has drawings of castles and buildings which seem normal at first glance, but when you study them, become architectural impossibilities. 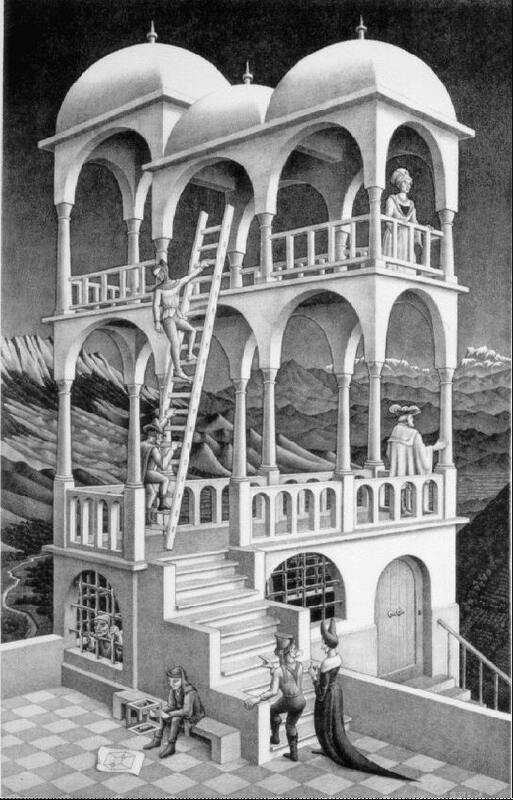 He has one drawing where soldiers are climbing up some stairs on the top of a building, but there is no top or bottom to the stairs. They just keep going round and round without ever getting higher. He has pictures of stairs that go every which way and at the same time, go nowhere. Escher’s drawings always evoke a double-take. You look at them, and they seem okay, but then it begins to dawn on you that something is not right with the picture. Things are not as they seem. Up’s down, down is out, out is in. Stairways circle back to where you’ve been. Time falls, water crawls, are you listenin’? through a maze of exit doors? I have seen the light by Braille. I have blazed the road before us. We’re walking in Escher’s World again. Rise up you nimble-minded men. Birds roar, lions soar, sheep are cruel. Snails pace, papers chase, midgets rule. Stuffed shirts, status hurts, we ain’t foolin’. The remake’s on its way. We’re wide awake within our dreams. I love that song, because it reveals that this world we are living in is not the way things are supposed to be. We think this world is the way things are. We think this world is normal. But it is not normal. It is not right. It is not the way God intended. Everything is upside-down and backwards. We think life are normal, but we are living in a bent world. C. S. Lewis, in his three masterful Space Trilogy volumes, reminds us frequently that the inhabitants of Mars, the hrossa, view the inhabitants of earth as “the bent ones.” Even when angels appear on planet earth in Lewis’ trilogy, they stand at an angle. This is not because they are off kilter, but because we are. They are straight, and we are the crooked ones. Christ reveals this in the sermon of Luke 6. He challenges everything that people think is normal, and flips it upside down to show how things really are from God’s perspective, and how they will be in eternity. Because of this, each of His statements are shocking. Each statement of Christ is a jolt of reality in our twisted world. We’re looking at one version of Christ’s sermon in Luke 6. There is a longer sermon in Matthew 5, 6 and 7. Some people think that these are two different sermons in two different times in two different locations. Others think they are the same sermon and Luke has given us the abbreviated account. But whether they are the same or different, we still have to understand and apply each one in it’s own context. The context of the sermon in Luke is found in Luke 6:17-19. He has just finished choosing twelve apostles out from among His disciples, and now, before he turns to teaching, He heals the multitudes. Luke 6:17-19. And He came down with them and stood on a level place with a crowd of His disciples and a great multitude of people from all Judea and Jerusalem, and from the seacoast of Tyre and Sidon, who came to hear Him and be healed of their diseases, as well as those who were tormented with unclean spirits. And they were healed. And the whole multitude sought to touch Him, for power went out from Him and healed them all. One of the reasons some people think that this sermon is not the same sermon as the one recorded in Matthew is because in Matthew it says that Jesus want up on the mountain to teach, whereas here it says he came down and stood on a level place. Those who say that these are the same sermon argue that Jesus went up the mountain to pray, and then he came about half way down the mountain to a level place on the mountain where he chose his disciples, performed the healing we see here, and then began to teach. He is still up on the mountain, but at a level place, or a plateau on the mountain. Luke 6:17 goes on to say that He is there, not only with his newly chosen twelve apostles, but also a crowd of disciples, and a great multitude of other people from the surrounding regions. The reference to Tyre and Sidon indicate there may have been Gentiles there as well. The last part of Luke 6:17 says that this multitude of people came for two reasons: to hear and be healed. They came to hear what Jesus had to say, and be healed by Him of their sicknesses and delivered from unclean spirits. Both of these things happen – the healing first. Luke 6:19 says that the whole multitude sought to touch Him, for power went out from Him and healed them all. Jesus healing ability was drawn from the power of the Holy Spirit at work through Him to heal. His close, intimate connection with the Father as revealed through spending all night in prayer, was another factor that allowed Jesus to heal the multitudes. Notice that is not just some of them that were healed, but all. We do not know how many thousands of people were there, but everyone who was sick was healed. Unclean spirits were cast out. Power went out from Jesus to heal them all. There is no discussion here about their lack of faith, or the amount of faith they do or do not have. Jesus simply and completely healed all who desired it. The reason for this great display of miraculous healing is due to the challenging truths Jesus is about to teach. In the early New Testament, especially among the Jewish people, healing and signs of power were a sign to the Jews that God was at work through the one doing the healing, and that person’s words could be trusted as true. In the Old Testament and the New Testament, since they didn’t have the Bible, a prophet would often be called upon to give a prophecy about the future, or perform some sign or miracle in order to prove that they were truly from God. Only true prophets of God could consistently perform such miracles. When the miracles were seen, the people could know that this prophet could be trusted. Today, though miracles and healing do happen frequently by the power of God in response to our humble prayers, God has given us the Bible by which we can judge the truthfulness or error of someone’s teachings. This is why Christ gave his apostles the ability to heal also, so that people would know that their words could be trusted. Even then, none of the apostles or prophets performed as many miracles as Christ. This is because the miracles that accompanied Christ’s ministry were a sign to the Jews that He was the promised Messiah. In Luke 7, for example, John the Baptist, who is by this time in prison, begins to wonder if Jesus truly is the Messiah or not, so he sends messengers to question Jesus. Luke 7:21 says that at that very hour, Jesus cured many, cast out unclean spirits, and gave sight to the blind. Then Jesus told these messengers of John to go back and tell John what they had seen. The miraculous wonders that Jesus performed were intended to reveal that He was the Messiah. Beyond even this, such signs and wonders reveal the heart of Jesus. Do you know that never once did Jesus perform a miracle of judgment? Never once did He cause someone who could see to go blind. Never once did He call down fire from heaven to incinerate His opponents. Never once did He cause a Pharisee to whither up and die on the spot. Though his apostles sometimes wanted Him to do these things, and though these sorts of miracles happen frequently in the Old Testament, Jesus never performed a miracle of this kind. All of Christ’s miracles are tender and compassionate. He chiefly chose those acts of healing which would reveal His infinite tenderness and mercy. All things considered together, Christ’s miracles were intended to reveal that He was a prophet of God, and more than a prophet, He was the Messiah, and not the Messiah the Jews were looking for – one coming in judgment – but a tender and loving Messiah wanting to draw all men unto Himself. But at the same time, as we’re about to see, His teaching were not intended to tickle the ear. Christ’s goal in preaching was never intended to give people what they want to hear, but to give them instead what they need to hear. Although his miracles and healings and free meals had attracted great multitudes of people, He did not try to give them what he thought they wanted to hear. He gave them the hard truth – that following Him would be a tough road. Jesus spoke of poverty, hunger, and persecution as blessings, and of wealth, being well-fed and favor as bringing a curse. He taught people to love their enemies, and not to retaliate. He taught that one should give to those in need, knowing that they would never be repaid. These are not very popular teachings. Yet He knew that it is better to speak the truth and not be popular with men, than to speak lies and have everybody like Him. This is what we see him doing in Luke 6:20-26. These verses contain four blessings and four woes. And it is in these blessings and woes that we run headlong into Christ’s upside down world which is actually right side up. Blessed are you who hunger now, For you shall be filled. Blessed are you who weep now, For you shall laugh. Blessed are you when men hate you, And when they exclude you, And revile you, and cast out your name as evil, For the Son of Man’s sake. Rejoice in that day and leap for joy! For indeed your reward is great in heaven, For in like manner their fathers did to the prophets. “But woe to you who are rich, For you have received your consolation. Woe to you who are full, For you shall hunger. Woe to you who laugh now, For you shall mourn and weep. Woe to you when all men speak well of you, For so did their fathers do to the false prophets. The answer is no. But because Christ’s statements are so backwards from what we have been taught all our lives that people of all sorts, Christians and non-Christians alike have struggled to understand what Jesus is teaching in this section of blessings and woes. One non-Christian British psychologist, following Sigmund Freud, accused Jesus of promoting masochism. Mahatma Ghandi, on the other hand, believed that the teachings of Christ in this Sermon held up the highest ideal for how to live life. Even Christians struggle with what Christ is saying. Most Christians, especially in our materialistic, modern America, tend to spiritualize these sayings so that we don’t have to apply them. Other Christians say that Christ is only giving us a description of how things will be in the Millennial kingdom, so we don’t have to live like this now. Still others argue that Christ is just laying down a standard which is so high that we will all recognize the utter impossibility of keeping it, and so will become aware of our own sinfulness. The bottom line is that the sayings of Christ are challenging. They confront us right at home, and challenge everything we hold most dear. For example, what if Jesus was living here in America today, and decided to write a letter to the President telling him what he should focus on. First I want to advise you to stop worrying so much about the economy and jobs. A lower Gross Domestic Product is actually good for the country. Don’t you understand that the poor are the fortunate ones? The more poor we have in the U.S., the more blessed we are. Theirs is the kingdom of heaven. And don’t devote so much time to health care. You see, Mr. President, those who mourn are blessed too, for they’ll be comforted. I know you’ve heard from the Religious Right about the increasing secularization of our country. Prayer is no longer allowed in schools, and protestors against abortion are subject to arrest. Relax, sir. Government oppression gives Christians an opportunity to be persecuted, and therefore blessed. Thank you for the expanded opportunities. The word for Blessed is far too sedate of a translation from the Greek. It is better to translate it “Congratulations!” or “Oh, you lucky person!” How many of you can say, “I’m so lucky to be poor!” When something terrible happens in your life, and all you can do is weep and mourn for days, have any of you ever thought, “Wow! Why can’t all my life be this way?” No! None of us think such thoughts. And yet, that’s what Jesus is saying. Can you feel the tension in this text? Does it seem that what Jesus is presenting here doesn’t seem like reality? 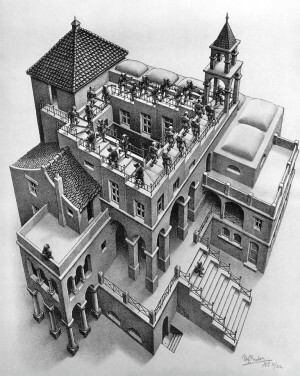 Well remember, it doesn’t seem like reality because we’re living in Escher’s World. Because of sin, things are upside down and twisted around and backwards in this world. Jesus is not describing how things are, He is describing how things will be in this world for the true disciple of Jesus Christ. You see, the Sermon on the Mount in Matthew 5-7, and this sermon in Luke 6, whether they are the same sermon or not, could be called the Discipleship Manual. And just as with any manual, Jesus begins with a description of the product. When you open up your car manual, it begins with a description of the car itself. It’s make, it’s model, it’s year, the various options that may or may not have come with your car. When you buy a new computer, you open the box, and right on top is the manual. You open it up, and it tells you to make sure you have all the pieces and tools you will need. It describes them and gives you pictures and tells you what king of computer you have. In Luke 6:20, Christ turns to speak specifically and especially to all of His disciples and tell them what being a disciple truly looks like. He is going to give them the Discipleship Manual, and he begins with a description of what their life will look like if they follow Him. This is not a description of how to get to heaven, or what life will be like in the coming Kingdom. This is a description of how the committed disciple of Jesus Christ should try to live his or her life. It is a sermon not just about outward actions and behavior, but about the inner attitude of the heart. The sermon is entirely about attitude. For the Disciple of Jesus Christ, attitude is everything. Luke 6:20-26, which we are looking at today, are about your attitude toward life’s circumstances. Luke 6:27-38 is about your attitude toward other people. Luke 6:39-45 concerns your attitude toward yourself, and Luke 6:46-49 discusses your attitude toward God. Related to these are four essentials to true happiness. You will be happy, or blessed as a disciple of Christ if you keep your faith in God, if you love others, if you are honest with yourself, and if you obey God. There is great cost in following Jesus, but the blessings are greater than the cost. This is what the eight statements in Luke 6:20-26 reveal. Each of these eight statements is a spiritual Atom bomb. They blow away and completely obliterate any shallow talk of discipleship. At the same time, they construct for us the architecture of what being a true disciple of Christ may entail. What he presents seems backwards and upside down, but this is the how all true disciples of Christ will appear in this world. So let’s turn to these descriptive items to see what it really looks like to be a disciple of Jesus Christ. All I am able to do in this sermon is provide some general observations about these blessings and woes. It is helpful first of all to notice their structure. 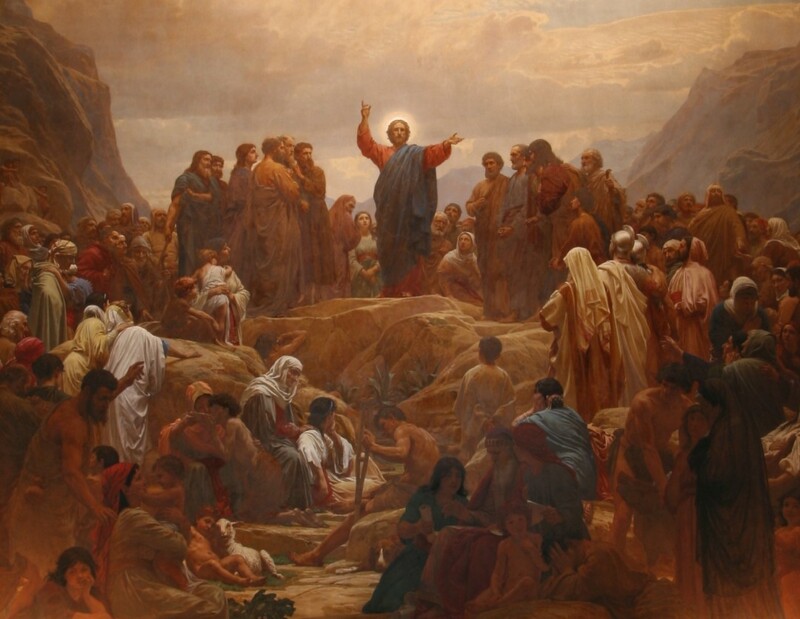 (Luke 6:20-23) ABCD Blessed are you poor,Blessed are you who hunger now,Blessed are you who weep now,Blessed are you when men hate you, And when they exclude you, And revile you, and cast out your name as evil, For the Son of Man’s sake. For yours is the kingdom of God.For you shall be filled.For you shall laugh.Rejoice in that day and leap for joy! For indeed your reward is great in heaven, For in like manner their fathers did to the prophets. (Luke 6:24-26) A’B’C’D’ But woe to you who are rich,Woe to you who are full,Woe to you who laugh now,Woe to you when all men speak well of you, For you have received your consolation.For you shall hunger.For you shall mourn and weep.For so did their fathers to the false prophets. There are four blessings and four woes. Each blessing has it’s exact opposite in the four woes. Each blessing has a counterpart woe. The first blessing is upon the poor (Luke 6:20). The first woe in Luke 6:24 is upon the rich. The second blessing, in Luke 6:21, is for the hungry. The second woe, in Luke 6:25, is for the full. The third blessing and third woe are related to weeping and laughter (Luke 6:21b and Luke 6:25b). The fourth blessing and fourth woe are about how we are viewed by other people of this earth (Luke 6:22-23 and Luke 6:26). Notice further that each of the eight statements is balanced by a physical condition and it’s resulting spiritual consequence. The first half of each statement contains a physical condition that many followers of Jesus Christ might find themselves in. Either they are in this condition because that is what life has dealt out to them, or they are in this condition because they have decided to follow Jesus. In Christ’s time and in that part of the world, there were many poor and many sick, many outcast and many afflicted. For some of them, this is just the way thing are. But for others, these things happened to them because they decided to follow Jesus Christ. James and John, for example, who are two the Lord’s apostles, had to turn their back on a rich inheritance in order to follow Jesus. Their father Zebedee was rich and prominent, but when James and John decided to follow Jesus, they most likely lost all that would otherwise have been theirs. Because they chose to follow Jesus, they became poor. Others, as we learned last week, because they followed Jesus, they would experience hardship and trials and persecution, and nakedness and danger and sword. All of the apostles except John were martyred for their faith. They were hated and reviled and cast out and eventually killed for the sake of Jesus. And Jesus promises them that if they endure these physical conditions, if they persevere under trial, if they are content to have little or no food and possessions, then they will receive great spiritual blessings in this life and the life to come. If they weep and mourn because of what happens to them, they will be uplifted and encouraged and even laugh with joy for how real Christ will be to them, and how closely He will walk with them in this life and the life to come. If they stand up for the truth and as a result are hated and scorned, Jesus tells them to be happy and excited, because they will receive great reward in heaven. The bottom line of the blessings is contentment. The true disciple of Jesus Christ has the spiritual discernment and wisdom to see that even if they are physically poor, they are spiritually rich. Even if they are physically hungry, they are spiritually full. Even if they are mourning and weeping about what happens to them in this life, they can have the joy of the Lord as their strength. Even if people of this world hate them and ridicule them, they know they have great wealth and blessings stored up for them in heaven. Here is the principle: Any negative circumstance in your life is a doorway to greater blessing. Whether the negative circumstance has happened because you are a devoted follower of Jesus Christ, or just because bad things happen in life, that negative circumstance can lead to great spiritual blessing. It’s all about the condition or attitude of your heart. Do you trust God in your circumstances, or do you not? Whatever circumstances you find yourself in – trust God. The apostle Paul did this, which is why he can write in Philippians 4 that although he is sometimes without food, sometimes he is beaten and slandered and imprisoned, he has learned the secret of being content in all situations. The secret is an eternal and spiritual perspective. He writes in Philippians 4:13 that he can do all things through Christ who strengthens him. This is the secret to living the contented life, even when from a physical viewpoint, there is not much to be contented about. Every negative thing that happens in your life and my life is another opportunity for spiritual blessing. We may see God provide in a miraculous way. We may experience God’s presence and protection in ways never before imagined. We may understand new truths about the Bible or come to grasp a whole new dimension about God that we were formerly ignorant of. Even if the blessing does not come in this earth, we know that there are great rewards stored up in heaven for those who stand firm under persecution and worldly trials. If, as a disciple of Jesus Christ, you stand up under poverty, and hunger, and weeping and public scorn, congratulations, you are a great success. The four woes, of course, are the reverse of the blessings. We must not understand them to say that every Christian who is rich, or every Christian who laughs, or every Christian who is popular isn’t much of a Christian and will not receive reward in heaven. The point made by Christ is that as one of His disciples, these things in the woes must not be the things we chase after. Though all the world chases after riches and entertainment and fame and glory and popularity, true followers of Christ know that such things are empty and meaningless in light of eternity. If you chase after these things, you are almost certain to get them, but that is all you will get. Jesus does not say these things are wrong. He said that seeking them first, and being satisfied with them is wrong. Seeking these things as more important than the things of God will lead to an empty and meaningless life. There will certainly be Christians in heaven who did chase after riches and fame and glory, but because they chose to chase after worldly pursuits, they will miss out on great reward in heaven and a wonderful, intimate relationship with Jesus Christ here and now. Jesus is saying that, as one of His disciples, these four things must not be what we are striving for. If we are rich – fine, but don’t be greedy for more, and use your riches to help those who do not have as much. If you have plenty of food, great. Thank God for his provision, make sure that you are not wasteful or gluttonous, and if possible, feed others who are not quite as blessed. This is what Jesus is teaching. It is an upside down world we live in. Jesus is trying to flip things back. We, as His disciples are to show the world what right side up living looks like. It’s all about an attitude of the heart. Be content with what you have, and seek first the Kingdom of God. We do not have to live according to the stifling standards of a sinful world any more. You can be poor and be a great success. 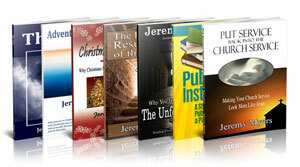 You can be persecuted and be popular with God. You can be hungry, and yet have food this world knows nothing of. Understand this: not all Christians are called to a life of poverty, hunger, weeping, and rejection. But when a choice must be made between money and God, God must come first (Matt. 6:24). Money is not evil, unless it takes the place which only God should have (cf. 1 Tim. 6). When we must choose wealth or Jesus, being well-fed or Jesus, laughter or Jesus, we must always choose Jesus. Giving up lesser benefits for greater ones is a principle practiced by all who are wise. We give up immediate pleasures to save our money to buy something that is of lasting pleasure or value. Runners give up food and even friends to maintain rigorous training, all for the joy of winning the race. Sacrifices are a blessing when they lead to greater blessings. That is what Jesus was saying in this sermon. We’re living in Escher’s World, where everything is upside down and inside out. But Christ has come to turn it into His World. Interesting. I will have to try that. 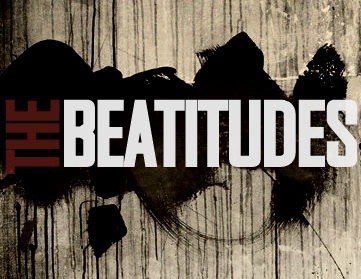 I have heard it said that the beatitudes are a picture of what a christian should be like. Yes, I agree. It is a discipleship manual. A guide for followers of Jesus. I love, Jeremy, that in Philippians 4:13, Paul commands that we are to be content in our circumstances …not content with them! Thank you so much for this message. i was seeking more understanding on this scripture in order to better teach it to my 5th grade children’s church. You message shed great light for me on this passage and I so appreciate you sharing it with your depth of insight and research.